In this episode I will be fixing the whining power steering pump. 5:05 – Removing the reservoir return hose. 6:35 – Removing the reservoir outlet hose, the reservoir and cleaning it. 7:33 – Removing the power steering pump high pressure line and the o-ring. 8:20 – Removing the power steering pump intake and the o-ring. 9:54 – Installing new o-rings. 10:26 – Re-installing the power steering pump high pressure line and the intake. 12:00 – Re-installing the reservoir and the hoses. 12:26 – Adding new power steering fluid and starting the car. 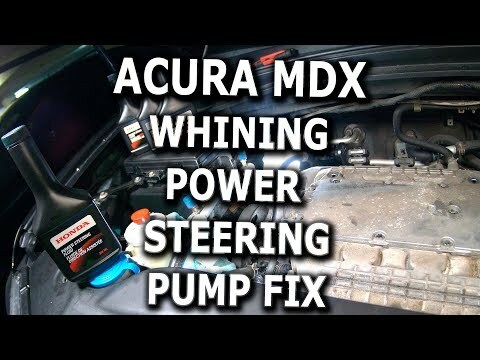 You can fix a similar issue on other Acuras/Hondas or pretty much any other car with a power steering pump using this video. Ссылка на русскую версию появится через неделю. Nice video. Keep up the good work. Check out my channel. I’m trying to build my sub count. This is so crazy you uploaded this because ever since the cold weather mine has been doing the exact same thing.